Full disclosure: I've never purchased an expensive curling iron in my entire life. Leading up to college, I hung on to the same (affordable) iron for far too long; toward the end of its life, it had burnt-on hair product and needed to be warmed up for a good half hour before it was hot enough to actually produce a decent curl. Finally, I took a look at the sad remains of my drugstore iron and decided it was time for an upgrade. Since then, I've graduated to Hot Tools curling irons. As soon as I got a taste for a better performing tool, I noticed an immediate difference: My curls lasted longer, looked far better, and I could do my entire head of hair in half the time. I was perfectly content with the way my hair looked. Still, I didn't need to offer up a big chunk of change to pay for it (my current iron was on sale for only $20), which led me to question: Are expensive curling irons actually worth it? I decided to put them to the test. For my hair-curling experiment, I decided to search for two irons beloved by customers at both affordable and high-end price points to compare against each other. 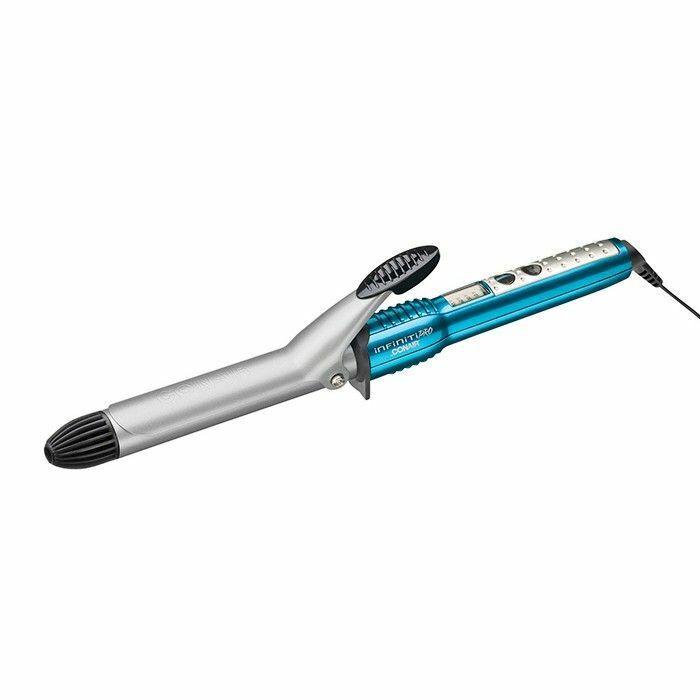 After scouring through reviews, it seemed as though the Conair Infiniti Pro Curling Iron ($20) would be a winning choice. For the high-end iron, I went with the Ghd Curve Classic Curl Iron ($200). I also chose these specific irons because they are both one-inch irons with a clamp to cut down on variables. For an immediate visual of how the irons would measure up to one another, I curled the right side of my hair with the Ghd iron and the left side with the Conair curling iron. As soon as I opened the box that this iron came in, I knew that it was going to be a stand-up product. The packaging was crazy chic, and it came with its own Mini Masterclass booklet teaching you how to create different types of curls. I plugged the curling iron into my bathroom outlet, pressed the power button, and was greeted with a digital "whooshing" sound. About a minute later, another sound went off, which meant that it had been heated to 365 degrees, the "ideal curling temperature," according to the box. So this is how the one percent lives, I thought. I began curling my hair using my go-to method and hoped that the iron would start talking to me or something; alas, not a peep. All kidding aside, the box instructed me to only leave the hair wound on the iron for 5–8 seconds. I thought that there was no way my hair could possibly curl so fast, given my usual iron takes about 10 seconds, but after I uttered "5 Mississippi" and released the hair, a gorgeous, tight curl appeared. I couldn't believe it! I continued doing the rest of the right side of my hair and was left with a beautiful set of curly waves. The only thing I didn't enjoy was that the tip of the iron was rather small, so rotating the iron was a bit difficult, but otherwise—wow. I was impressed. Next, I swapped in the Conair iron and let it heat up. It didn't make noises, but it did have a screen showcasing various temperatures for you to choose from. I opted for 360 degrees and went to work on the left side of my hair. To really see how it would stand up against the Ghd iron, I only held the hair in the clamp for five seconds, but after I released the hair, I noticed that I had a much looser wave than the Ghd iron. Like a persistent parent, I wasn't satisfied and felt that the iron could produce a better curl than that, so I put the same section of hair back in and held it on the iron for a few seconds longer. Lo and behold: a much tighter curl. I continued holding each section of hair for the same amount of time and curled the rest of the section. When I was done curling, much to my surprise, both the left and right side of my hair looked almost identical. I raked my fingers through my hair, gave it a good flip, and didn't spritz any hairspray to give the curl-holding power a true test. After a full day of work, a particularly cold and rainy day, and even a yoga class, both sides of my hair still held a good amount of curl. However, I will say that the side curled with the Ghd iron was just a bit tighter than the side curled with the Conair iron. So what's my conclusion? For starters, I think that the user experience with the Ghd iron was phenomenal. It truly felt like a high-end iron and I loved how quickly it curled my hair. However, I had an easier time rotating the Conair iron and felt that even though I had to hold the hair in for a few seconds longer, it still performed exceptionally well. Long story short: If you have the money to spend on a curling iron, the Ghd iron is definitely a worthy investment. But (much to mine and my wallet's delight) the Conair iron is a stiff competitor and delivers very similar results, so you can still get a good, long-lasting curl for a small fraction of the cost. What's YOUR favorite curling iron? Tell us below!